Are you often put off opshop garments because they have huge shoulder pads that make you look like an American football player? I found this dress (labelled “Chloe” … but made in New Zealand!) at the Salvos but nearly walked away because of the ridiculous padding. Clothes are cut to accommodate shoulder pads and removing them can completely alter their shape. So I was a little apprehensive about snipping them out, but the good quality cotton, interesting tailoring around the sleeves and its potential versatility made me shell out the $7.50 on the price tag. And fortunately it’s none the worse for my little refashioning effort. All accessories from opshops and markets except the earrings which are from my Wilderness Bazaar range (wildernessbazaar.com). Shoes from Bared… one of the few pairs my old lady feet can tolerate for a full day of walking around. 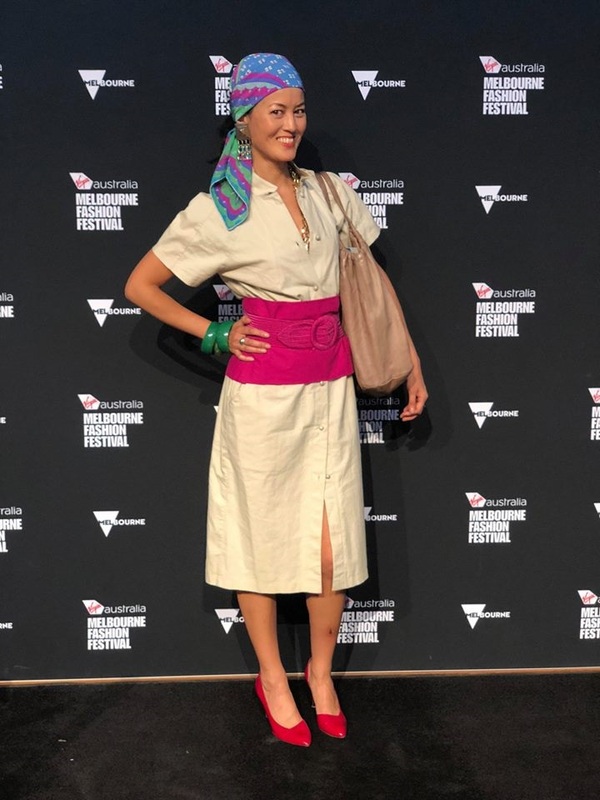 I bought this Emilio Pucci scarf for a few dollars at Fitzroy Market and made the cummerband for last year’s Melbourne Cup breakfast. It just happens to perfectly match my pink opshop belt! 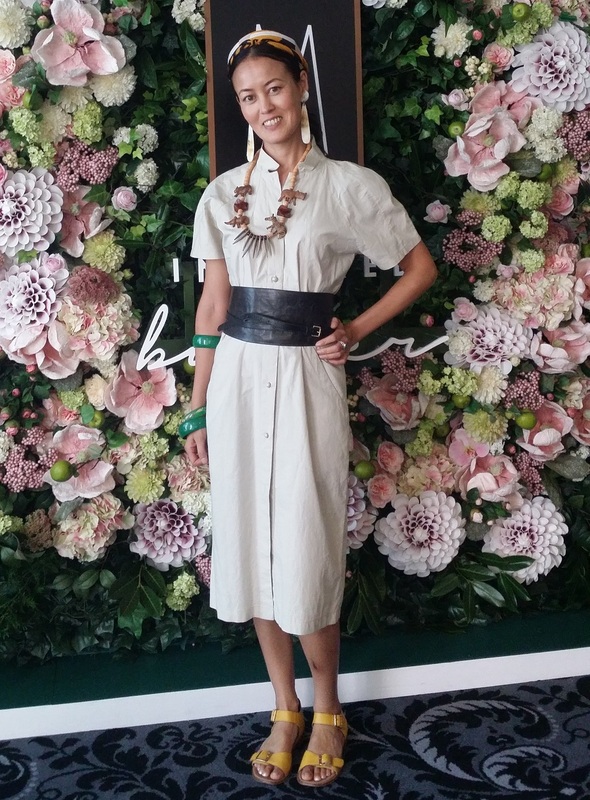 …and another safari-inspired look for the Sussan AW launch. I love this fringed, painted bag which I got a few years ago at an opshop. I’ve never seen another one like it. I made the necklaces from some red bean seeds and turquoise beads. The mud-painted sash is from Tokyo, of all places… and the buffalo horn toggle is from an opshop in Toorak. Fancy! It’s not often that I buy a monochrome piece of clothing, let alone something beige, but I’m enjoying the way the dress forms a backdrop for my (overly extensive!) accessory collection so I’m glad I took a chance on it, despite its initially crazy padded proportions. Admittedly, though, some garments – particularly some jackets or structured, tailored tops made from firm fabrics – won’t look right if their shoulder pads are removed, so consider this before you get overzealous with the unpicker! It’s a fabulously versatile piece – well worth the risk! I love they way it seems to highlight everything you wear with it without drawing overdue attention to itself. That’s $7.50 well spent!